Welcome to the Year 2018 with many more new announcements to enhance your security in the field of tech and at the same time fix many other glitches that might occur now and then. Many users started facing a very rare known error of Whatsapp which states: ” The Version of WhatsApp Became Obsolete on 13 Jan 2018. Please Go to the PlayStore to Download the Latest Version. ” And to our surprise, if we go to PlayStore, we find no updates. Well, here we have the quick fix for the same after which your WhatsApp Obsolete Error will be fixed very easily. 1 Which Devices Facing WhatsApp Obsolete Error? 2 Why Does WhatsApp Became Obsolete Error Popup on my Device? 4 How To Avoid WhatsApp Became Obsolete Error in near Future? Which Devices Facing WhatsApp Obsolete Error? Generally, I myself got this error on all my Custom ROM running devices, mainly MI Devices. If you are one of the Redmi or MI user then you might also got this WhatsApp became Obsolete on 13Jan 2018 on MI Note 4 or other MI Devices. And when you try to update the same from Play Store, you are left with no updates and if you plan to Leave Test Version, nothing happens. 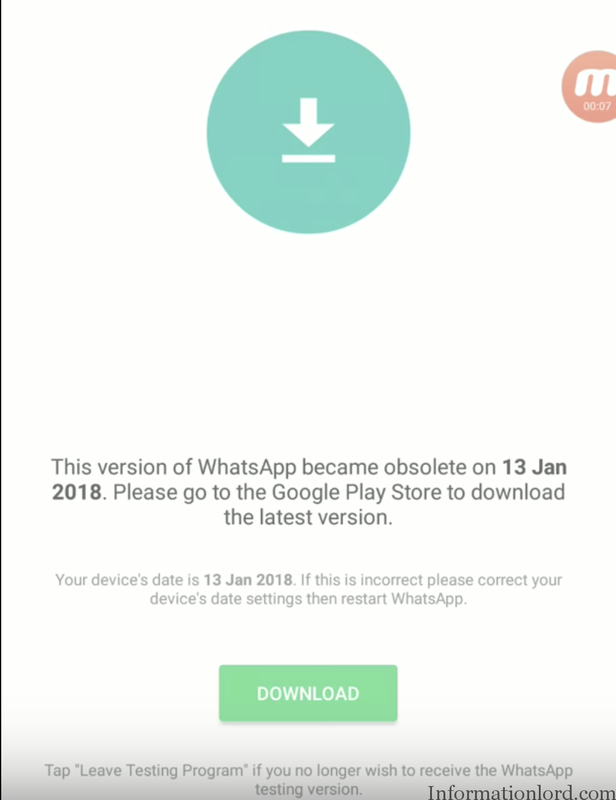 Why Does WhatsApp Became Obsolete Error Popup on my Device? The reason for the error of WhatsApp Obsolete popping on your device is very simple: Not getting the required updates within the timeframe. Therefore, the quick fix for WhatsApp not working on your phone is to install the latest version of WhatsApp (Official) manually without data loss. Head over to Play Store and Search for WhatsApp App and Update to the Official App available (if any). Once installed, you may now use the WhatsApp without any obsolete error which acts as a quick fix without any loss of media and other chats in your old WhatsApp. How To Avoid WhatsApp Became Obsolete Error in near Future? Well, one can at least be prepared for the upcoming apocalypse if you are not able to avoid it 😛 Here are the few tips that can help you prevent losing your important WhatsApp data. Participate in beta developer program wherein you are provided with latest beta updates of WhatsApp. Make sure you have all your backup in order to proceed with the same. One can signup to WhatsApp beta from here. Try avoiding usage of Custom ROMs until you know what you are doing. Suggestions are always welcome, therefore, let us know if you find better ways to avoid problems with WhatsApp Obsolete error on your devices.